12 New Books About Contemporary Jewish Identity — All by Women! The cover of the New York Times Book Review this weekend features a review of 5 recent books detailing the American Jewish experience — all of which were written by men. As illuminating as each of those books may be individually, and as deeply as the review engages with them, their aggregation egregiously leaves out the experiences and perspectives of approximately half of American Jews (if not more!). Critics on Twitter immediately noted how unfortunate it is that the piece didn’t at the very least call attention to the cutting-edge academic scholarship and writing by many Jewish women, including feminists. But the debate goes beyond academic (specialized) vs. trade (general audience) dichotomies. In 2018, it’s simply not enough to throw up ones hands and say, “There aren’t enough trade books by women!” The critic’s job is, in part, to wrestle with why trends in an industry exist, and to therefore, in this case, ask what truths five books by white Ashkenazi men might all be missing about contemporary Jewish identity. Dana Schwartz has a knack for getting the internet’s attention. Whether it’s impersonating the pretentiousness of the aspiring male literati for her wildly popular “Guy in Your MFA” fictional Twitter account or taking on Jared Kushner for enabling anti-Semitism—while he was her boss at the New York Observer—Schwartz knows how to harness the zeitgeist by being herself. 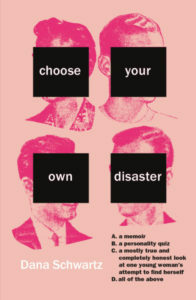 Next week, she’ll release her memoir disguised as a personality quiz, “Choose Your Own Disaster.” At the seasoned age of 25, Schwartz plumbs the depths and heights of her college and post-college life to bring us poignant hilarity about travel, angst and eating disorders–as well as finding romance and the elusive adult self. She spoke to Lilith recently about stereotypes around women’s writing, where her sense of humor comes from, and the worst Jews in public life.